During 2019, information will be updated as received to show what each team has accomplished during the year. At the end of the year this information will be copied over to the Versatility and Top Five Award pages and until then, those pages may be available to be viewed. The posts will be as close to alphabetical order by dogs' calls names as possible. As Awards Team manpower allows self print certificates will be made and sent to each team, capturing their year's activities. Title events currently in process by AKC will be assigned to a category and implemented on the starting the date AKC implements the event title. Any rule changes will be implemented by the Yearly Awards Team in collaboration with a member of the Board of Directors at any capacity in good standing and will not need further approval by majority vote. This will expedite the process without delay. All changes MUST be reported to the General Membership so everyone has the same opportunity to participate in the all awards. At such time as sufficient entries are received to significantly effect those receiving awards, the Awards Committee reserves the right to adjust levels or split out categories as necessary. The Top 5 Junior Award is for Junior handlers between the ages of 9 up through 18 only. Each Junior must handle at least 1 Miniature American Shepherd. Junior teams will not be added to the Top 5 as the Junior/Pee Wee category includes titles and achievements in all venues and are unique. The team may also be recognized in Versatility awards and the Junior handler will be recognized in the description of handler. Appropriate awards will be determined yearly by the Award Team. Top 5 Pee Wee Award for Pee Wee participants is for children 5 through 8 who handle Miniature American Shepherds in Conformation. All children will receive an award which will be determined by the Awards Team. The Top 5 will be determined by number of certificates, awards (i.e. BOB, Group, Puppy Kindergarten) or titles up to 9 months old in the year. After 9 months the puppy will be moved to the perspective event. This means puppies can move to Top 5 after they earn any title when they are 10 months or older. These puppy teams could possibly have a Top 5, Yearly Versatility AND a Puppy Antics award. These teams will receive an appropriate award as determined by the Award Team. Up and Coming Puppies who have not earned awards yet may be listed on the page - Come On! We all love to see puppies! This program highlights the top 5 teams in each recognized AKC sport. Some sports may be divided into more than 1 level. The award period is from January 1 through December 31 yearly. The order depicted on the Top 5 Awards page for each sport/level on the MAMASC website will not necessarily be in the order of highest to lowest placement. Top 5 awards in each sport/level will be determined as detailed below. All ties will receive an award, as long as the tie is for a title which makes it into the Top 5 sport/level. If a team earns a title in more than 1 level under a sport, they can receive a placement in each level. Each team will receive 1 plaque or other award, determined by the MAMASC award team and treasurer, which recognizes all Top 5 placements for an award period. HIGH IN SPORT AWARD - For the dog/handler team in each sport who earns the highest and/or most titles and certificates. Ties will be broken by number of highest title, most titles, top three scores, jumps or times. HIGH OVERALL TOP 5 AWARD - For the dog team who earns the most awards/titles/certificates in ALL sports. Ties will be broken by most sports, number of titles, scores, jumps or times. 5 Levels - Top 5 placement for each level. Ties in each will get an award. A and B are grouped together where appropriate. It is recognized preferred dogs jump at a lower height than regular dogs. Should there be a time when there are sufficient award entries in Agility, the Awards Team reserves the right to split out preferred from regular. Level 2) Novice Standard, Novice JWW, Novice Standard Preferred and Novice JWW Preferred. Level 3) Open Standard, Open JWW, Open Standard Preferred and Open JWW Preferred. Level 5) Premier Standard, Premier Jumpers with Weaves, Premier Standard Preferred and Premier JWW Preferred. 3 Levels - Top 5 awards for each level. Ties in each level will get award. 5 Levels - Top 5 awards for each level. Ties in each level will get an award. 2 Levels-Top 5 awards for each level. Ties in each level will get an award. Level 2) Trialed (includes Herding Started, Herding Started Master, Herding Intermediate, Herding Intermediate Master, Herding Excellent, Herding Excellent Master, Herding Champion.) Determined by the highest title. 4 Levels- Top 5 award for each level. Ties in each level will get an award. Top 5 by highest title. Ties will receive an award if the title makes it into the Top 5. Title must be submitted to AKC with proper fees for recording by AKC. Titles earned in BHA, but not submitted to AKC for recording, will be recognized as a non-AKC title for Versatility Awards. 3 Levels-Top 5 awards for each level. Level 2) Therapy/Service Dog- All teams will be recognized in the Top 5 as long as the proper application and fees are submitted to AKC to be recorded as a title. The number of hours must be submitted to MAMASC. Titles earned in other venues may be used for Versatility if not recorded by AKC. Level 3) FDC- There is only 1 level, so each team will receive an award. Top 5 awards for each level. Ties in each level will get award. If titles are earned through DMWYD, the proper application and fees must be sent to AKC to be recorded as a title. DMWYD titles can be used in Versatility, but Top 5. 1 Level determined by title. Ties will each receive an award. As sufficient entries are received, the Award Team will review the need to break out levels. 2 Levels. Top 5 award for each level/Ties in each level will get an award. Level 4) Air Retrieve – will be by highest title. Dedicated to the dogs who have worked with their owners and achieved more than one title each year in any venue. 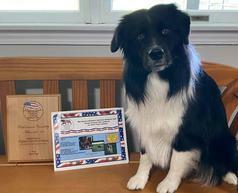 These awards show the true versatility of the Miniature American Shepherd. Award descriptions are included at the top of each award section. Teams are not in any certain order within each section. Entry information must be submitted by January 31 of the subsequent year. The page is not final until after that date. We have such AWESOME dogs, AWESOME owner/handlers and an AWESOME club! Our Awards program has not significantly changed for 2019. As AKC makes changes to their programs, the Award Team will review and make parallel changes to our program. If entries for awards change drastically, levels and awards will be evaluated by the Award Team and Treasurer. Continue tracking of your team's progress throughout the year! The sooner you start turning it in, the sooner you will see your dog on the website! Below you will see these documents to turn in your awards on. Simply download once, add some events, turn in, go earn more, add to form, turn it in again, add more. Or if you like to do things online, click on this Google Drive Form link to submit your activities from your phone, tablet or computer. Send word documents and photos to kbaileycooper@gmail.com by mail or Karen Bailey Cooper private message on Face Book.